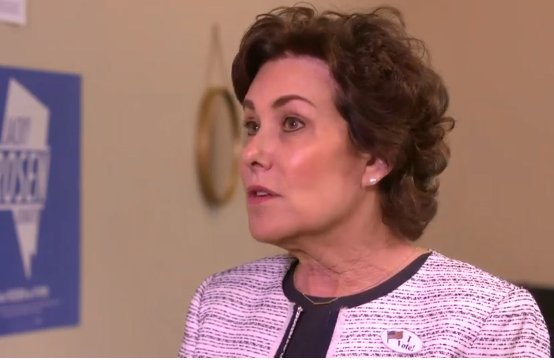 U.S. Senate candidate Jacky Rosen is "disappointed" Trump isn't setting "national example"
Nevada Democratic Rep. Jacky Rosen, who's challenging incumbent GOP Sen. Dean Heller for his seat, wants to see more from President Trump in the wake of Saturday's mass shooting that claimed 11 lives at a Pittsburgh synagogue. "What I want the president to do is to set that example, that national example for us," she told CBSN's Caitlin Huey-Burns in an interview in Las Vegas Monday. "And I'm really disappointed that he's not doing it." "What he needs to do is be a real leader and stand up and have empathy and try to talk to people in a way that honors the loss of lives, the loss of their loved ones, their memories," Rosen said. She also feels that the president needs to figure out what the nation will do going forward, because there are children "that are afraid to go to school, afraid to go to the movies" in the current climate. A former synagogue president, Rosen told CBSN that the Pittsburgh shooting hit her hard. "It was so devastating to me -- as a Jewish woman, as an American, as a person of faith," she said, dismayed that the massacre took place "somewhere that you think is a sanctuary and worship," adding, "You should feel safe there." "Whether it's churches, synagogues or mosques, our schools, our movie theaters, a concert on a nice fall night...people should feel safe and not feel under attack. And so I'm concerned by the rhetoric. We can disagree on policy," Rosen said. "That doesn't mean we have to be disrespectful, and it doesn't mean we should be ramping up this divisiveness that's going on."